Bill of Rights - First 10 amendments of the Constitution. Amendments 11-27. Constitution and Citizenship Day - K-12 lessons. Constitution Day - Lessons and activities on understanding the people and the ideas that created the U.S. Constitution. Constitution Lessons and Resources - Dozens of lesson ideas and other resources from Education World. Constitution of the United States - See a copy of the real thing here. Constitution Quiz - Basics of the constitution (10 questions). Our Government: The Constitution - Click on your grade level for resources. 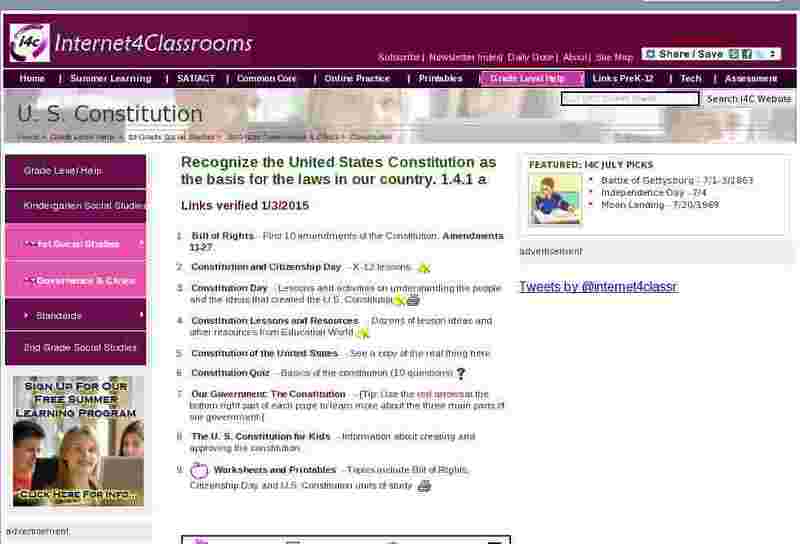 The U. S. Constitution for Kids - Information about creating and approving the constitution. Worksheets and Printables - Topics include Bill of Rights, Citizenship Day and U.S. Constitution units of study.